SACRAMENTO–Governor Jerry Brown issued two executive orders to further assist communities recovering from devastating fires – one to help ensure students displaced by this month’s Camp, Woolsey and Hill fires are able to return to school as soon as possible and another to extend the state’s prohibition on price gouging during emergencies for counties recovering from July’s Mendocino Complex, Carr and Klamathon fires, as well as counties impacted by numerous wildfires last year, including the Tubbs, Nuns, Atlas and Thomas fires. The order related to the Camp, Woolsey and Hill fires includes provisions to facilitate the use of temporary school facilities and waivers for requirements related to class size, outdoor physical education and school district residency. Earlier this month, Brown secured a Presidential Major Disaster Declaration to bolster the statewide emergency response and issued an executive order to streamline recovery efforts. 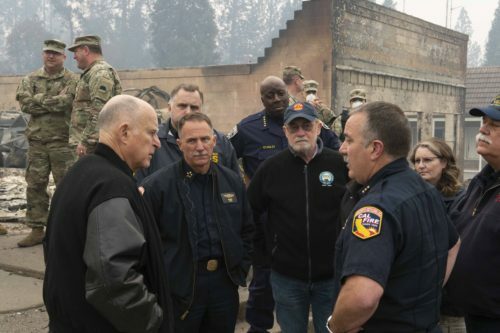 Governor Brown also met with residents impacted by wildfire in Butte and Ventura counties, joined President Trump to discuss recovery efforts and survey Camp and Woolsey fire damage and held briefings on the ongoing response with top federal, state and local fire and emergency management officials at the Incident Command Post in Camarillo and Chico and the State Operations Center in Mather. A state of emergency has been declared in Los Angeles, Ventura and Butte counties and California secured direct federal assistance to further support the impacted communities – within 24 hours of making the request. Federal Disaster Unemployment Assistance benefits have also been made available for workers, business owners and self-employed individuals who lost jobs or had work hours substantially reduced due to the wildfires in Butte, Los Angeles and Ventura counties. Information on the resources available to residents impacted by the fires can be found at http://wildfirerecovery.org/.